THIS IS the story of the search for "e;Faceless Fritz"e;-the most difficult and frightening camera-hunt ever undertaken by ace photographer-reporter Margaret Bourke-White. "e;Fearless Fritz"e; was cable shorthand for one of several LIFE assignments that brought Miss Bourke-White and her camera to Germany some months before its fall. She was to pin down the private German citizens-t… o find out what kind of human being it was who, multiplied by millions, made up the Nazi terror. Was he cruel? Was he a villain? Or was he a jolly, gemutlich, beer-drinking, music-loving sentimentalist so many of us remembered, who had really been helpless in the power of a small gang of madmen?By the time Margaret Bourke-White arrived in Germany on this mission, she had seen much death and danger. She had been in Moscow during its fiercest bombings. In Italy she had come closer to the enemy lines than any American woman before her. But it was in Germany that cold horror overtook her.The Germany that Miss Bourke-White saw and recorded in this book puts to shame Dali's most grotesque nightmares. It is a physical and spiritual chamber of horrors, a cuckoo-cloud land whose inhabitants live in a lost dream. They are the people whose faces are as usual and recognizable as neighbors', but whose reactions do not seem to make sense. "e;Dear Fatherland, Rest Quietly,"e; which was first published in 1946, takes its title from the words of the anthem, "e;Die Wacht am Rhein,"e; to which German soldiers have marched three times in the memory of many now living. 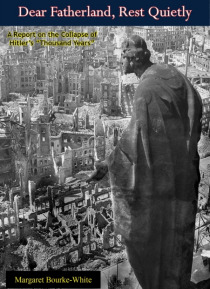 It brings new light to bear on the German people-in the hope that through a more immediate understanding of them, a fourth march may be averted...Richly illustrated throughout with 128 of her photographs, with detailed captions, forming an integral part of Margaret Bourke-White's important report on conquered Germany.